I am not against Strikes. I am against Thugs! 1. How in a modern EU country are certain things allowed to happen? 2. Where are the Police + Armed Forces? 3. What will be the implications on Brand Malta?? 4. Is it not illegal to kidnap a Person off a bus, beat him and to block a Street with a vehicle? Was anyone arrested - with all the witnesses around?? Solution: The government should invite other EU transport providers to come and operate emergency services in Malta. 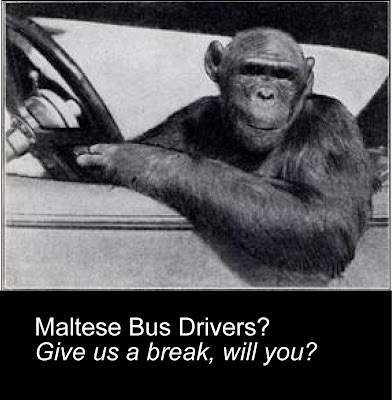 The government should offer them and passengers alike security to immediately restore a safe transport service in Malta for all, and quick. Message to Strikers: Get an education. Nobody is above the law. All other businesses have competition, even pastizzi vendors - YOU are not any more special than the rest of us. PS: 'Bass' (pronounced exactly like the English word 'bus' in Maltese is slang for 'to fart', or to put in mildly, to 'release air'.